There's no shortage of RC helicopters for sale. Trying to pick one out to buy is difficult, but Silverlit have managed to distinguish one of their helicopters by including a built-in camera to capture both photos and videos. This could be used by a sneaky child or by a mischievous adult or it could be used for genuinely useful purposes. 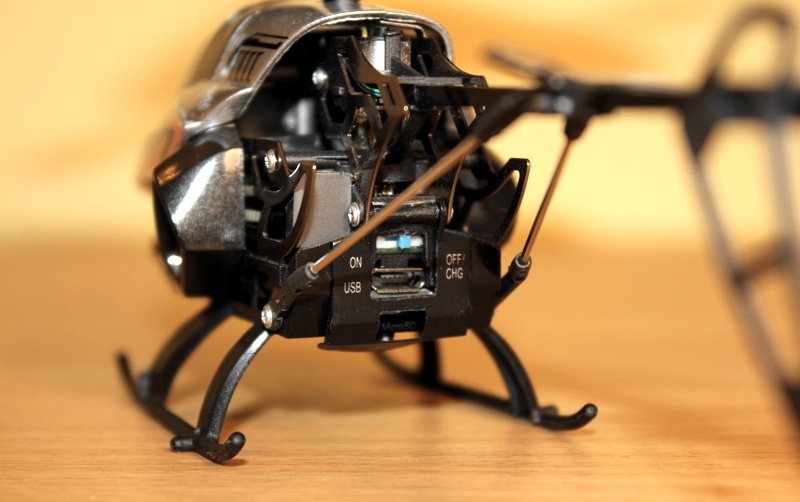 It's called the Spy Cam II, a new and updated version of the the Spy Cam helicopter series. The Silverlit Spy Cam II doesn't look unlike other RC helicopters, it's small measuring 19cm in length and lightweight and pre-assembled. The design of this helicopter is smart and streamlined, with only one colour scheme appearing to be released at present which has a silver body and red and black decals. Upon testing we've found it to be exceptionally rugged; from past experience we know that many RC helicopters last for a week or so, because after a few hard landings they refuse to fly correctly. The Spy Cam II has been seriously trashed around our studio, with momentary impacts we even felt justified some sort of future flight problems, but no such problems came about. The rotary blades are made from solid thick plastic, the body is constructed from both metal and injected impact resistant plastic, the tail is also made from metal and has remained firmly in place which is very important for directional exactness. This helicopter has an inbuilt lithium polymer battery with a run time of around ten minutes from full charge based on our own experiences within tests. This isn't a huge length of time for flight but in comparison to other similar RC helicopters it's about the standard duration of a flight, because in all cases the battery power consumed by the motor is hefty. But we'd like more battery life for longer flights, ten minutes quite literally flies by. It does, however, charge very quickly and conveniently via an inbuilt micro USB cable within the controller using the AA batteries for power. But we prefer not to waste the AA batteries juice and keep them for powering the controller which just sips the battery in comparison to charging the helicopter's internal battery. We found that we could charge the Spy Cam II over a micro USB cable plugged into a wall plug like the ones supplied with Apple iDevices and it charged just fine. It saves having to buy expensive AA batteries. 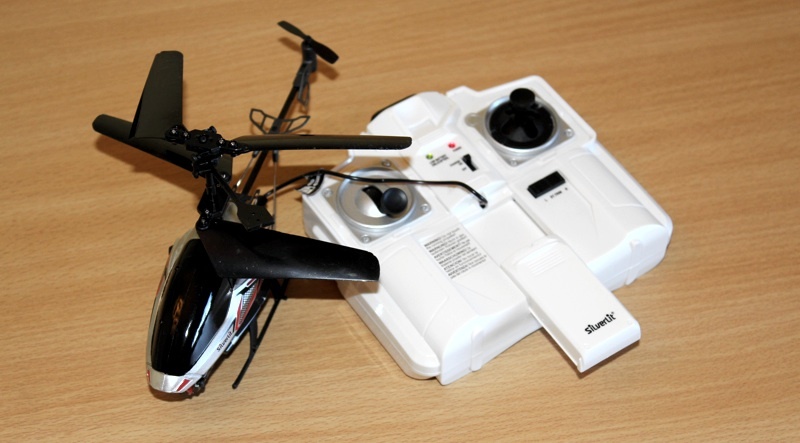 The Spy Cam II uses 2.6GHz three channel technology which supports up to ten helicopters flying at the same time. The infrared signal is suitable to be used indoors with a range of around 30ft, but outdoors in the sun it lags and is not responsive, which is something which flaws infrared when exposed to bright sunlight, so the weather conditions need to be dull and even then it's not 100%. Silverlit list this as being an indoor helicopter, and our studio is large and open which are the ideal requirements for an enjoyable flight, but in more cramped home conditions you may struggle. The controller and helicopter when turned on connect quickly in around three/four seconds. 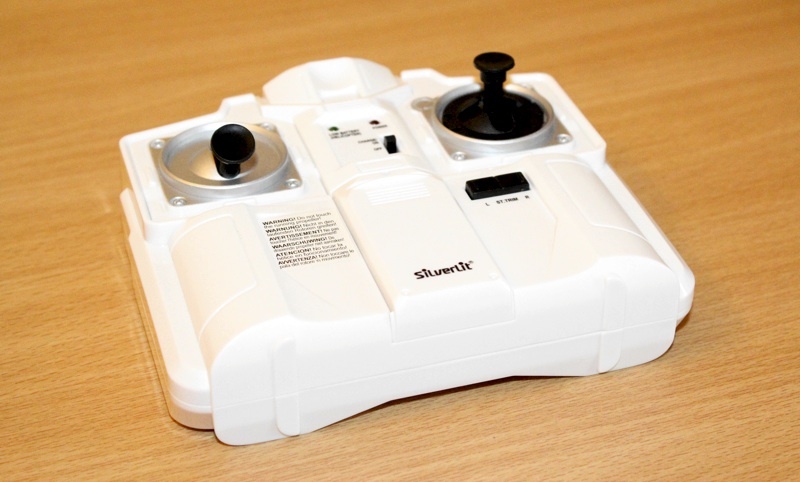 The controller is a standard plastic-like style found bundled with RC gadgets and requires six AA batteries which aren't included within the box. Its shape isn't outrageously ergonomic but gets the job done and doesn't irritate hands when being held and used, and importantly its control layout is simple and unchallenging for a child to understand. On the left is a joystick throttle and on the right is the directional control joystick. The directional control moves the helicopter forwards, backwards, left and right. This joystick is interesting and makes flying the Silverlit Spy Cam II even easier because you can only manoeuvre in one direction at a time due to the joystick having slotted grooves for each direction. Along the back side of the controller are two trigger buttons, one for taking a photo and the other for recording video, and an LED on the front of the Spy Cam II emits white light alerting the user that the camera is in operation. In the middle section of the controller are the on and off switch and above this are two LEDs, one shines red when indicating there is enough battery power in the controller and blinks when battery power is low, the opposing LED shines orange if the helicopter is running low on charge. Along the bottom right of the controller are the trim adjustment buttons. Mastering the flight style of the Spy Cam II was almost immediate for us. It has definitely been one of the easiest to manoeuvre of the remote controlled helicopters we've ever had the pleasure of flying. The inbuilt electronic heading lock gyro system plays a key role in stability whilst flying, but the control method offering definite one direction manoeuvres compliments the exactness in flights, even at high speeds. Flying this helicopter at low speed is relaxing and leisurely, accidents rarely occur when hovering/flying like this because manoeuvring is so placid and controllable. We would play a game at the studio telling one another where to land the Spy Cam II, usually in very tight and awkward places, and nearly always we could complete the objective landing because of the degree of accuracy we had. Accidents and impacts almost always happened when we flew the helicopter in a straight line forwards very quickly and tried to spin it before hitting a wall - yes this was another game we conjured up! This helicopter ramps up speed very quickly and is in turn extremely fun to fly fast. Usually we were successful at missing a wall, but occasionally it went straight into it and down with a thump, hitting objects below and meeting the floor all because of ill judgement on our part. But as we've already stated these heavy impact crashes have been brushed off by the Spy Cam II. The camera is located under the front nose. It's very subtle and discrete in its placement and so does have the needed characteristics for a good spying/surveillance helicopter. The downside to this is that we can't monitor the real time view the camera has, so we had to carefully align the helicopter when we wanted to capture targeted shots and this was hit and miss. The camera's angle can be manually adjusted on around a 90 degree basis, so the camera can be pointed straight in front or directly pointing at the floor and in between these two angles.Photos and videos can either be captured onto an internal 64mb memory or can be saved onto a micro SD card which isn't supplied. The quality of reproduction is similar to the quality of an early mobile phone camera but has a better frame rate. The camera module is petite, but captures photos at a resolution of 1280 X 960. Videos are shot in a 4:3 aspect ratio in VGA quality, and using the internal 64mb storage up to a minute of video can be recorded and 300 photos can be taken. The stabilisation is smooth, even at high speeds, when taking video but photos require stillness, the lens's angle seems quite zoomed in, so when we thought we were taking wide shots, they were actually rather close-up. Overall the camera's quality is fine for a bit of fun, nothing too serious. To download content from the Spy Cam II simply connect it via a micro USB cable to a computer and extract and view the contents like you would with a traditional digital camera. To sum up the Silverlit Spy Cam II, we'd have to say it's an extremely fun helicopter that will be enjoyed by children and adults alike. The build quality is exceptional and the manoeuvrability is tight and definite. But the Spy Cam's unique selling point is the inbuilt camera and to our surprise it captures stable and sharp photos and videos. The only improvement we'd like to see is a longer battery life, even though it sports a credible battery in contrast to its competitors. But a flight longer than ten minutes would be highly welcomed by us.